Anything to help, this bottle from Stelton can only help. Simple, sleek and useful. The bottle, top and lid may be washed in the dish washer and the grip may be washed at 30 degrees in the washing machine. Safety should be your first concern, no matter where you are at or what you are doing. TuneBug changes the safety issue of listening to music while you do your thing and puts it back on you to learn correctly. Mobile music typically means listening through headphones, dangerously isolating yourself from others and your environment. The Tunebug Shake is an ultra-portable sound generator that can be connected to iPods, MP3 players or mobile phones or used wirelessly using Bluetooth®. When mounted on a bike, skate or snowboard helmet, the Shake creates a surround sound experience. For more information about the Tunebug Shake click here. $299 for this much protection. Alpinestars S-MX Bionic Protection Jacket is high performance for the over protective rider. Race developed S-MX external thermo-plastic shoulder protection. Lightweight, technical stretch mesh construction with side zip entry, one piece chest panel. One piece, integrated polypropylene chest plate. Removable CE Certified (level 2) Bionic Back Protector. Adjustable dual waist Velcro® closure. Hey new workout and machines are released everyday, but if you can't have a climbing rope in your gym or garage then VMX Multi-Mode Rope Climberr is a great substitute. VMX is a multi-mode rope climber with three exercise modes - vertical pull, diagonal pull and horizontal pull. Each mode delivers unparalleled variety of strength and cardio exercises that target your entire body. - One unit enables strength, cardio or rehabilitation exercises. - Tri-position sliding carriage enables quick and easy mode changes. - 7 resistance settings with dynamic breaking system that adapts to each user. - Bi-directional: pull down or pull up (in vertical mode). - Specially designed rope is soft and easy to grip, yet durable and long-lasting. - Electronic display tracks distance, time, speed and calories. Wow, now why is it that the Uk is doing this for Rugby and American Football is not? American Football, those guys on the line are huge, sucking wind every chance they get. Imagine that on Fox monitoring the stats of a linebacker and the quarterback. The coach could take them out before they blow up and sub when needed. Wow this could completely change sports for the good. Would make it a heck lot more interesting to watch, cause why do they drink liquid every chance they get? Everyone want to ride all the time, winter and rain sometimes puts a stop to that and who wants to have mud flaps on their sleek carbon road bike. Well RoadRacer by Crud products has put a stop to the way that we look at mud flaps. They have such a tight fit that they are almost undetectable. 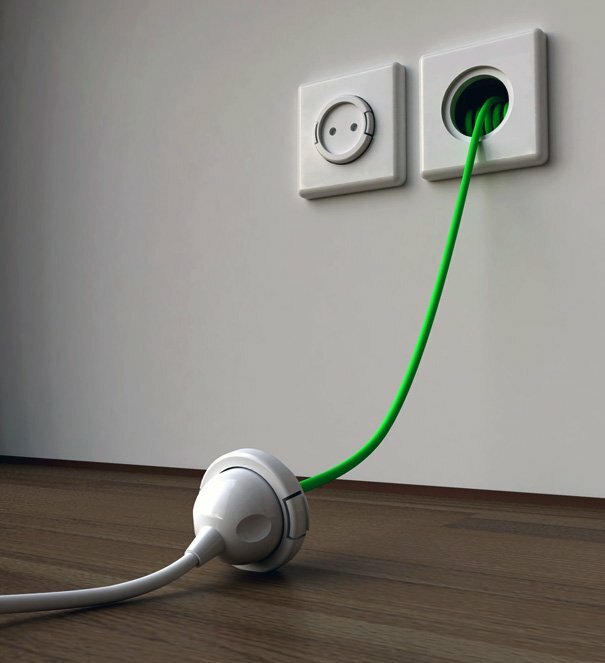 I want to be able to recharge my gadgets and gizmos with this, what a great idea. Rambler Socket maybe the solution most of us are looking for as far as extension cords are concerned. I mean if you hit “Extension Cord” on YD, for most of the posts you will see readers nitpicking and finding fault with the design. Here’s why Rambler Socket will knock your socks off. It’s this 1.5 meters cord that unfurls from a cavity behind its socket. When you don’t need extensions, it’s neatly tucked away. When you need it, simply pinch the sides and wind it out.